Original 10-in-1 components collected over the years. 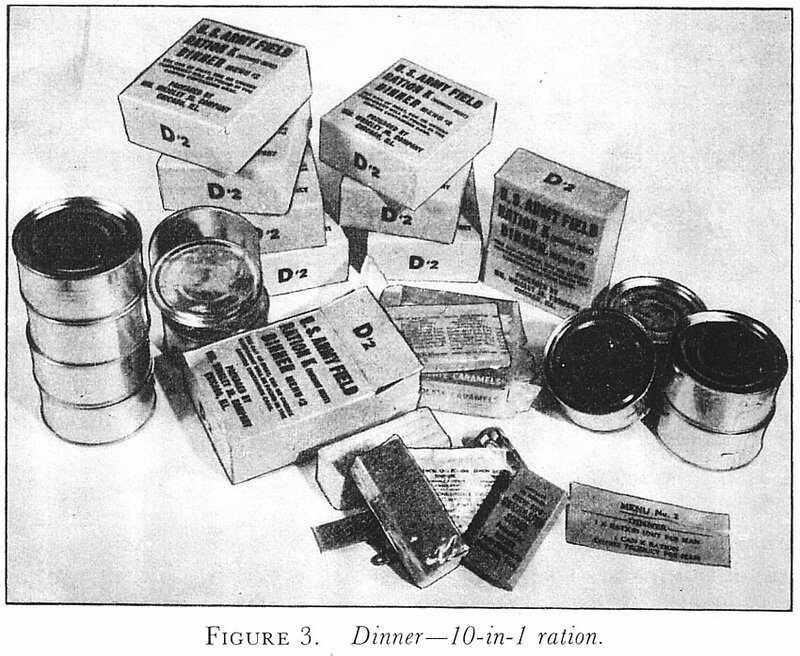 Official publication of the 10-in-1 partial (K ration) dinner unit. 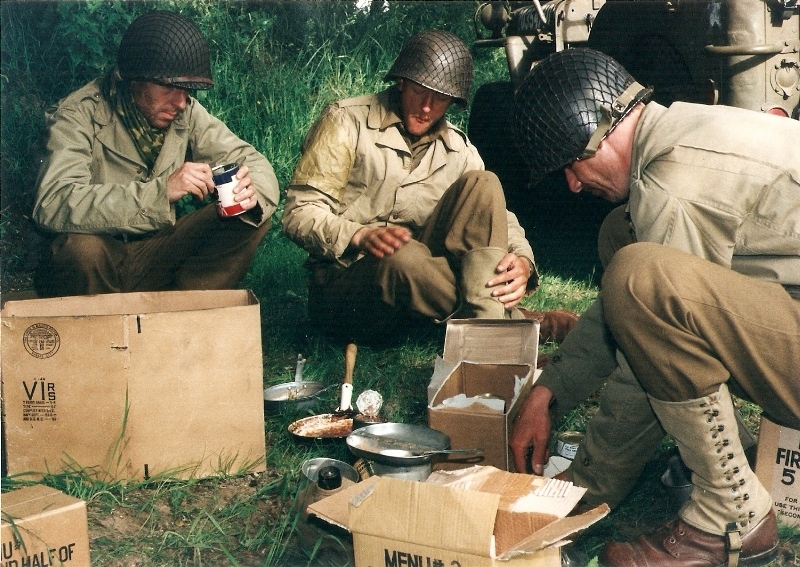 One of the more prominently visible rations on photos of the U.S. Army in world war 2 is the 10-in-1 ration. 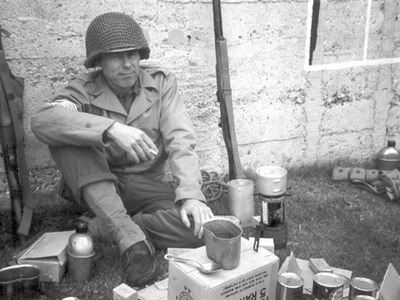 Its distinctly marked cardboard container can be seen prominently displayed on many a Sherman tank for instance. However it was designed so that it could also be 'easily' carried by one man and was thus not only intended for vehicle crews but for every American fighting man in the field. It was partly inspired by the British Composite Pack, or 'Compo Ration' that fed 14 men for one day and came in 9 different menus. This ration proved very successful in the North African campaign. Another inspiration lay in the general call for simplification as the war progressed that is also visible in uniform development (M-1943 uniform). Immediate predecessors of the 10-in-1 were the Mountain Ration and the 5-in-1 ration. 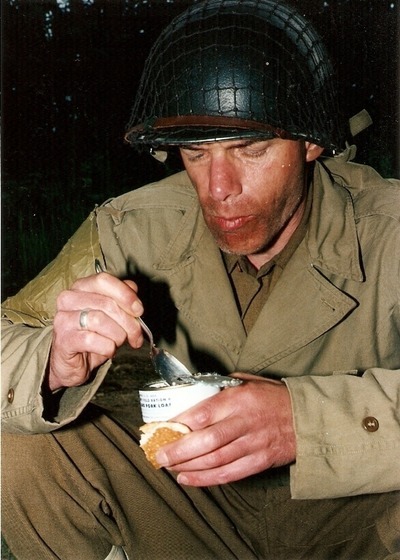 The idea was to have only four type of rations. A and B rations which are basically the same 'garrison type' of rations, with the B rations prepared in the field by field kitchens using canned rather than fresh foods, the K ration as individual ration and the 10-in-1 as group ration. The vitamin reinforced chocolate bar known as D ration was an emergency ration to be used only if none of the principal rations could be gotten to the troops. GI's preparing a meal from a 10-in-1 ration. France, 1944. 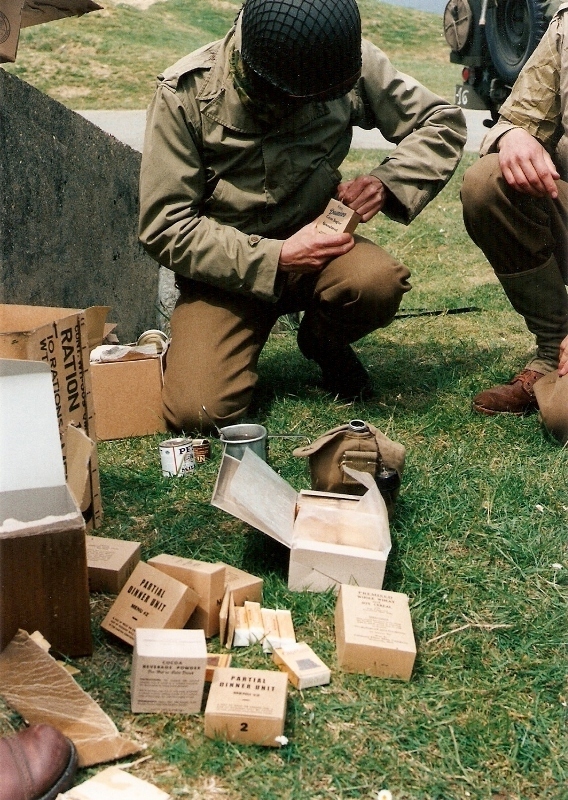 As collectors/re-enactors we found it a challenge to find surviving items of the 10-in-1 ration in spite of the numbers produced. One can think of several reasons for this. The ration's popularity for instance. It made a great change from the monotony of K rations. For the regular foot slogging dog face it was a rare treat. 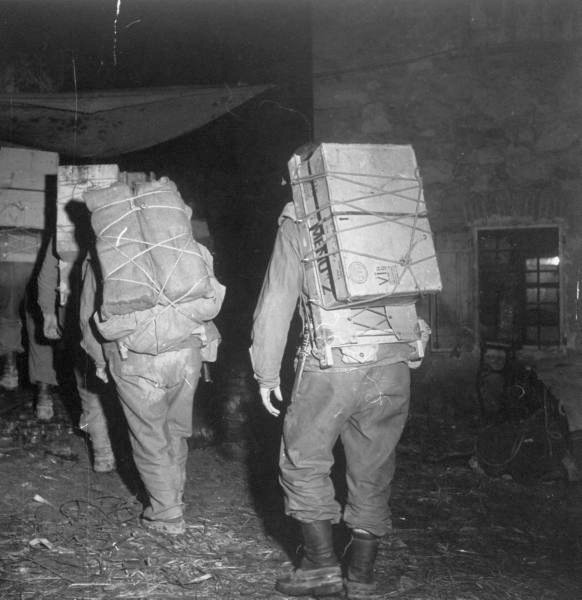 For vehicle crews it was far easier to carry one or two 10-in-1's around. 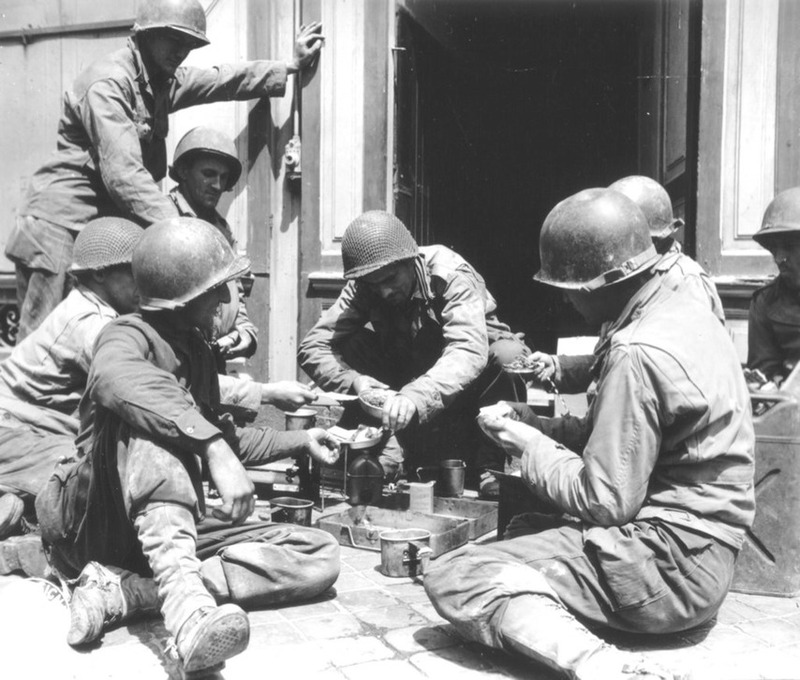 One veteran infantry man told us that the only way he ever got 10-in-1's was to steal them of tanks passing by. A hazardous thing to do but worthwhile. After all there were a lot of goodies in those boxes; candy, coffee, cigarettes and gum, corned beef hash, and what not. Menu 4 was a favorite of his. This held sliced bacon of which the fat was ideal for cooking anything you could find in the field. Another reason is the durability of the ration items once a box was opened. You can sometimes find the outer box and second half boxes as they were made out of sturdy solid fiberboard, often asphalt laminated. The first half boxes however were made of corrugated cardboard which is not nearly as durable so less survived. But boxes can be used for storage and that is how many survived. The sleeve however though made of even thicker solid fiberboard, asphalt laminated and with some sort of sisal matting between the layers made a great foxhole liner but otherwise turned pretty much useless after having been removed from the box. 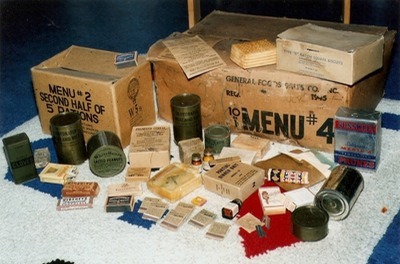 The 'second half' box contained canned items and the 'first half' box contained paper and cardboard packaging with salt, sugar, biscuits, cigarettes and the like. For those lucky enough to find these items they constitute real little treasures. As re-enactors we were inspired to copy the ration for living history events. The big box would surely make a nice prop as would the second and first half boxes. The challenge of course lies in making a perfect copy. A lot of your hard work will never show in photographs because a properly wrapped sugar cube simply is too small. 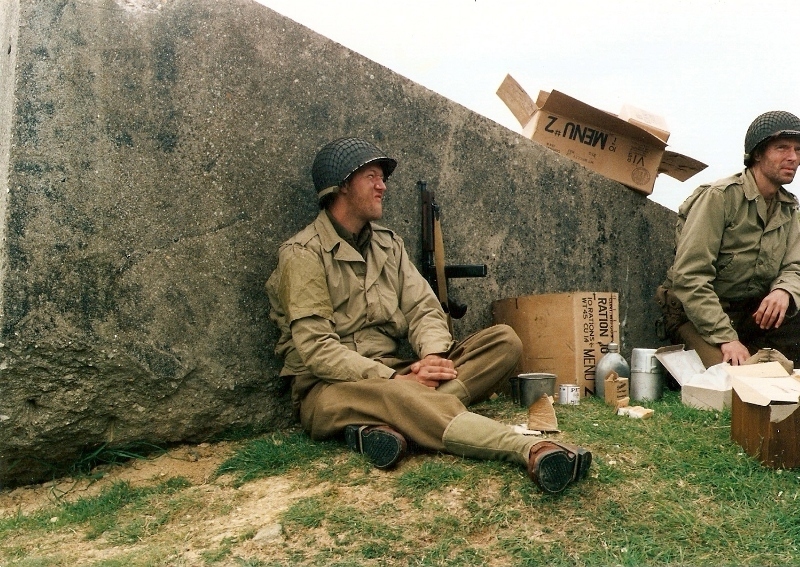 But an as realistic as possible ration does wonders for the atmosphere during a reenactment where you try to get everything right (with the exception of course of the actual suffering and mayhem of combat). On two events we carried a 10-in-1 in 'working order'. 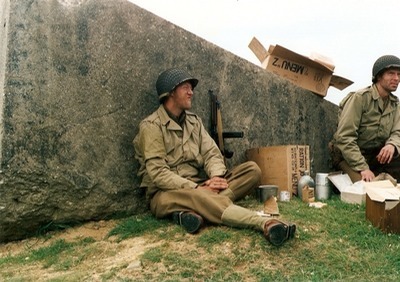 In our Lost Battalion reenactment (Militaria No. 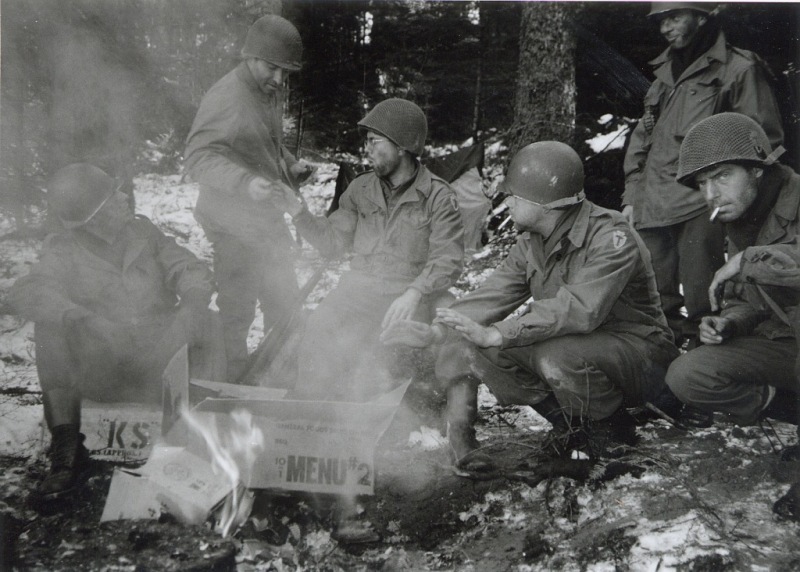 64) and again an greatly improved version last year when we re-visited the Vosges to portray once again members of the 36th Infantry (Texas) Division but this time in the right season; November. 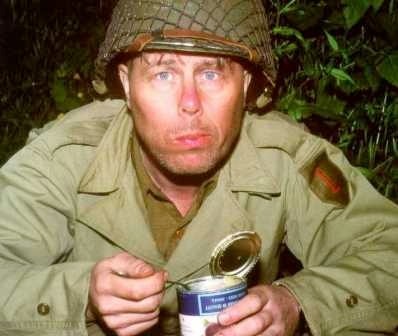 Again we found like the GI's in world war 2 that a 10-in-1 is a feast compared to a K ration, even though both our K's and 10-in-1 were just copies. Making a 10-in-1 takes a little more than $0.85 these days and handwork necessarily replaces what was once done by machines. It takes time to find canned food that fits your copy. You have to have access to original items for a good copy. But with the help of color copiers, computers and laser printers and most important friends it is all possible. And it's easier to make friends if you don't want to wheedle them out of their treasured ration items but just want to copy them. 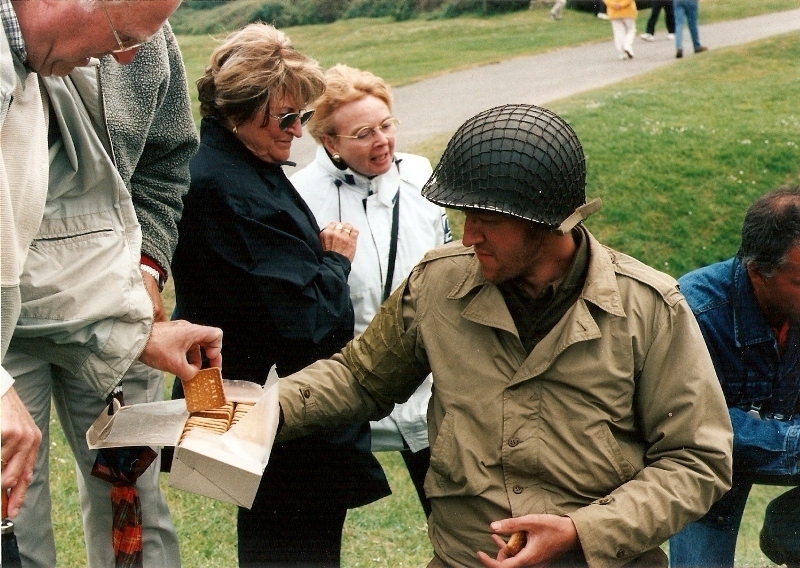 We found that way re-enactors can be friends more easily than collectors. 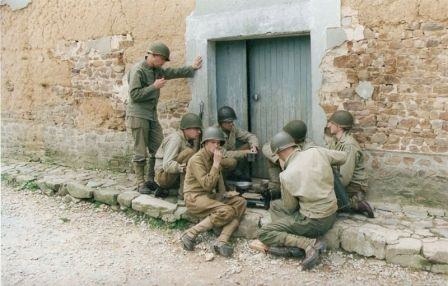 After all reenactment is teamwork. And although our theme is war we enjoy the way reenactment brings people together to have fun. And what can be more fun than and the end of an event sit around a bonfire as GI's and like them burn your empty ration boxes. Our sincere thanks goes to Mr. René Durand and his family of Anould, Mme and Mr. Armbruster also of Anould, Mr. Freddy Fève of La Chapelle-devant-Bruyères, l'Association Rock of the Marne and the people and authorities of Clefcy-Ban-sur-Meurthe, Les Granges de Chèvremont and Boslimpré for putting up with us.